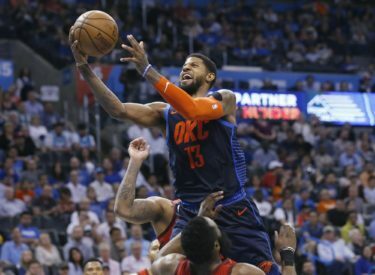 OKLAHOMA CITY (AP) – Paul George hit the game-winning 3-pointer with 1.8 seconds left, and the Oklahoma City Thunder rallied from 14 points down in the fourth quarter to beat the Houston Rockets 112-111. George added 27 points for the Thunder, who won their fourth straight. James Harden scored 39 points and Chris Paul added 24 for the Rockets.